The news at the meeting yesterday of the Brooklyn Arena Local Development Corporation (BALDC) was not that the special-purpose LDC was going to approve bonds for the arena, but the numbers and terms surrounding the bonds. And several important aspects of the bond sale remain unresolved. While the Empire State Development Corporation (ESDC) said in a statement that it had "secured investment-grade ratings" (and thus a lower interest rate) for the arena bonds, the Bond Buyer checked with Standard & Poor's analyst Jodi Hecht, who said no public rating had been made, leading ESDC spokesman Warner Johnston to acknowledge that the ratings had been "tentatively secured." Nor has an interest rate been set. Also, the bonds do not yet have insurance, a factor that adds a significant safety factor but adds to the cost. Officials of both the BALDC and underwriter Goldman Sachs said that such a "credit enhancement" was under discussion. The tax-exempt bonds would be repaid via such revenues as naming rights (the latter essentially a gift from the state), ticket sales, luxury suite license fees, broadcast signage and more. Given the lowered market for high-end spending at new sports facilities, various commentators, as noted in a Wall Street Journal article last month, have aired doubts about the revenue stream, though Goldman Sachs Managing Director Gregory Carey yesterday expressed confidence about it. Another was the size of the bonds: $600-$650 million in tax-exempt PILOT Bonds and $150 million in taxable Rental Bonds, the latter to be paid back by unspecified arena revenues. Given that the arena could approach $1 billion in cost--the latter sum was reported today in the New York Times, while Bruce Ratner has said it would be $800-$900 million--that leaves an equity gap that is being filled by developer Forest City Ratner and other investors. Unclear is why, despite the jettisoning of the more expensive Frank Gehry design, the arena cost would still approach $1 million. Also, state officials acknowledged that, as with the city stadium deals with the Yankees and Meets, the state could issue additional bonds for arena construction, though there are no plans to do so. Unclear is the interest rate for the bonds. While the Wall Street Journal reported last month that the developer hoped for an investment-grade credit rating and "interest rates of roughly 6.5%," the documents approved yesterday allow an interest rate of up to 8% for the tax-exempt bonds and 14% for the taxable bonds, the latter well into in junk bond territory. The bonds should be priced next week. Bonds could be put into escrow for up to one year while litigation is resolved--a contingency that became somewhat less important after the state Court of Appeals yesterday dismissed the Atlantic Yards eminent domain case. 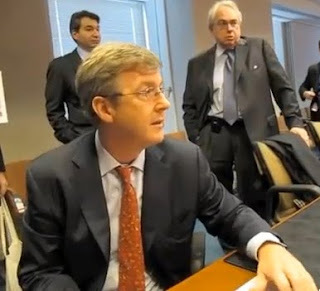 Held at the offices of the Empire State Development Corporation (ESDC) at 633 Third Avenue in Manhattan, the meeting began less than an hour after the Court of Appeals released its decision upholding the use of eminent domain for the project, a crucial hurdle, one that left ESDC officials in a noticeably good mood. 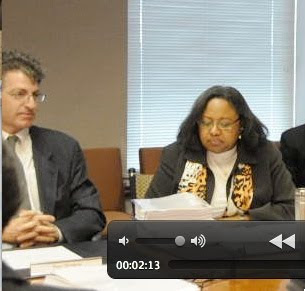 As shown in the video, when ESDC attorney Jonathan Beyer ad libbed a mention of the decision, there were some smiles. In attendance were a few project opponents, several journalists, representatives of Goldman Sachs, and ESDC/BALDC officials. The meeting lasted about 25 minutes, with the large majority of the time devoted to a presentation by Beyer. Only in the last minute of the meeting did new ESDC Executive Director Peter Davidson (left in photo, with ESDC General Counsel Anita Laremont), join the group. Also, Patti Hagan of the Prospect Heights Action Coalition brandished a yellow bag bearing the logo of State Senator Velmanette Montgomery, a project opponent, and a Stop Eminent Domain Abuse sticker. There were relatively few questions from the LDC members. Gubernatorial advisor Arana Hankin asked why some taxable bonds were included. She asked which would be paid back first; Beyer explained that, as with tax obligations, the PILOT bonds would be paid back first. And what if there aren't enough revenues to pay back the bonds? There would be no impact on the future bond issues of the ESDC, Beyer explained. Nor would there be any impact on the BALDC, which is a single-purpose organization. Left unexplained was what would happen if revenues were too few; officials later said the state wouldn't be obligated to pay. At one point, Carey explained that the firm would begin a marketing "roadshow" next week to bond funds that are "the main buyers of New York paper," firms that had already bought bonds issued in 2006 and 2009 to fund new stadiums for the Yankees and Mets. Would the bonds be insured? Goldman is in discussion with "the last bond insurer," Carey said, a reference to Assured Guaranty, but a decision won't be made until next week. "We're trying to get the lowest possible cost." Carey said that the goal is to sell the bonds during the week of December 7. "This transaction will close in mid-December," he said. Though the BALDC discussed $600-$650 million in tax-exempt bonds and $150 million in taxable bonds, the resolution passed yesterday allowed a maximum of $825 million. Also, according to documents distributed yesterday, the BALDC in a meeting on 9/11/09 set a $1.1 billion ceiling. "The action on 9/11/09 was a maximum number at the time for which BALDC adopted a Declaration of Intent which permits the use of tax exempt bond proceeds to reimburse certain expenditures," ESDC spokeswoman Elizabeth Mitchell later explained. "The $600 million and $150 million numbers are the best estimate right now of the actual issuance amount. The resolution states a maximum of $825 million to give Officers the authority and flexibility to conclude the transaction including all costs within a realistic cap based on current market conditions." In September, Bruce Ratner estimated to the Observer that $700 million in tax-exempt bonds would be issued. That same month, however, the New York City Independent Budget Office suggested that "a typical property tax assessment would result in a PILOT that falls short of payments needed to cover debt service in the early years" of paying off a $772 million arena bond. Carey took some questions from reporters afterward. In contrast, FCR executive Maryanne Gilmartin told Bloomberg News that $125 million of equity would be used for the arena. I asked about the calculation of PILOTs and total project costs. The Department of Finance, Carey said, will "use the replacement methodology similar to the way the Mets and the Yankees [stadiums] were figured." I said I thought it was a mix of replacement costs and land comparables. Carey said there are no comparables for such a facility. But "that is up to the New York City tax assessor. The benefit of this transaction--we don't even reach what actual taxes could be... for a period of time. We're not right up against what actual taxes would be, we're less." Still, during Congressional testimony in October 2008, then Department of Finance Commissioner Martha Stark said that taxes were estimated for specialty properties like sports facilities based on the "cost approach," the spending on construction, plus the value of the land. And for Yankee Stadium, the city used as comparables lots not in the South Bronx but in Harlem and Alphabet City--a very questionable process. Will potential cost overruns be mitigated? "For once, we have someone who actually builds for a living--that is, the developer of the project, but there's a guaranteed maximum price contract with Hunt [Construction]" Carey said. White, a lawyer and urban planner who formerly worked on bond deals in the state housing agency, asked, "Do you consider these bonds to be riskier than the original transaction, the differently designed arena that was originally approved by the PACB [Public Authorities Control Board[?" "I think this is actually a much more secure transaction," Carey responded. "Although the arena is much smaller than initially approved and can't be used for an alternative hockey team?" White pressed on. "We've looked at the revenue streams and feel very, very comfortable, and numerous people will come out and show that they're comfortable with the structure," Carey said. Carey demurred, saying he wasn't familiar with what the PACB approved: "There's less leverage on this transaction, and the way people look at this is cost per seat, so we actually view this as a much more secure transaction." I asked why the cost of the arena hadn't come close to the December 2006 approved level of $637.2 million, given the change to a less expensive design with a new architect and a decline in construction costs. "They [construction costs] went up so significantly, we're not down to '06 levels," Carey said. "This is New York City." 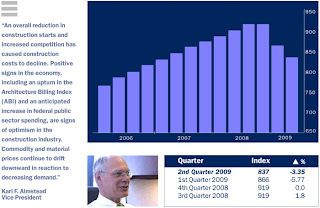 Well, as the chart (click to enlarge) from Turner Construction Company shows, as I wrote in June, by mid-2009 national construction costs had subsided to near-2006 levels. Beyond that, local concessions from unions and the construction industry in New York have lowered costs 8% to 20%, as shown in Forest City Ratner's renegotiation after stopping work at the Beekman Tower. That raises the question as to whether infrastructure costs and soft costs for the project beyond the arena are being subsumed into the arena price tag. Regarding Yankee Stadium, Assemblyman Richard Brodsky, in a report issued in November 2008, The House That You Built, criticized the city Department of Finance for accepting without independent inquiry Carey's "assertion of Stadium costs," though it "is customary and best practice" to have numbers certified "by a project engineer or other construction professional." Brodsky questioned the inclusion of costs such as “Equipment and Furnishing” and “Luxury/Sky/Boxes." No details about the arena assessments have yet surfaced. BALDC officials also took some questions. "The GPP was a plan by ESDC," Beyer said. 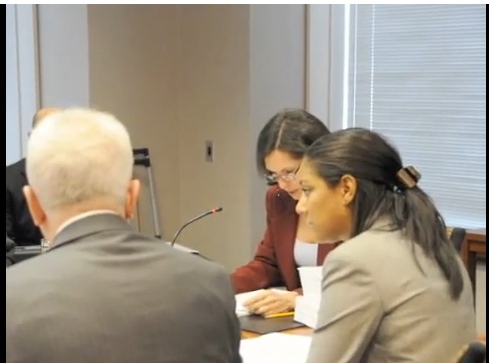 "This entity [BALDC] has the authority to issue the amount of bonds that it intends to issue." White tried to re-ask his question about the rising cost of the arena contrasted with its lowered capacity to generate income and house a professional hockey team? Ted Phillips of the Bond Buyer noted that Assured Guaranty seems to be the last viable bond insurer. "We're talking to several," Beyer responded, but said Goldman was taking the lead. Philips asked if there'd be a premium on the bonds given the remaining cloud of lawsuits. Walton smiled, responding. "Ted, as you know, bond insurance for any project these days, you're paying a premium." Schuerman asked, "And if Ratner can't make these payments, you're willing to let the bonds default?" "I don't know if I'd characterize it as willing," Beyer responded, "it's just that the documents do not require us to make any payments." "This is a bondholder risk," added ESDC Senior Counsel Steve Matlin. "That's what the bondholders are looking at when they're purchasing bonds." "That's not saying the exact same thing," Scheurman followed up. "You might actually decide, though you're not obligated, to bail out these bonds." "That's speculation," Walton said, shaking her head. "That's not foreseeable," Matlin said. I asked if they had any concerns about a scenario regarding questions about the land valuations for the PILOTs, as with the stadiums. "We've had no discussions with the New York City Department of Taxation and Finance," Matlin said. "There's a methodology laid out in these agreements. I think everybody's very confident that the assessment, when it does come out, will support the PILOT bonds." White again tried to ask a question: "Aren't these bonds inherently more risky than what was approved by the PACB and the ESDC becuase the arena is smaller--"
ESDC spokesman Warner Johnston tried to intervene: "We're going to take questions from accredited media." White clearly has legitimate tough questions, and his blog is valuable, but his behavior at the meeting made it difficult to switch hats from protester to journalist. Phillips followed up by asking if there was any plan to sell bonds in the future, as the Yankees and Mets had done. "There's no expectation at this time that the LDC will be issuing additional bonds," Walton said. "Is it permitted, though, in the bond documents?" Phillips followed up. Beyer, after turning and seemingly looking for a cue from colleagues, acknowledged "Yes." Did the BALDC need a private letter ruling from the Internal Revenue Service allowing the bonds to be put in escrow for a year? "We don't believe that was necessary," Beyer said. White tried to follow up, asking if the BALDC officials had any response to his questions. They turned and walked away. "I will take that as a no response," he said gravely. ESDC President Davidson, interviewed by the press after the meeting, expressed satisfaction with the court decision and the bond approval. He said a groundbreaking would occur early next year. But maybe the ESDC won't have vacant possession of the land until April or May, Schuerman suggested. "There's a lot of specifics still to be worked out," Davidson responded. "We're just happy this decision happened... and everything's pretty much on track." Are there a lot of homeowners who are going to be losing their places?" a NY1 reporter asked. "What about the displacement of homes and businesses?" Davidson seemed a little uncomfortable: "Issues are still going on. It's the process still under way." "What can you say about the people who will lose their homes as a result of this decision?" Schuerman asked. Davidson demurred, turning to spokesman Johnston. "I'd be more than happy to talk about that," Johnston said, not all that happily. "Peter has a very busy schedule. With regards to condemnation, I can get you specifics, but we're talking about a minimum of people to be displaced. The developer owns the majority of the parcels for this project." Yes, it's a relatively low number, in the dozens as of now, but that's not the full point, given that Forest City Ratner made its purchases under the threat of eminent domain. And when it comes down to actual eviction, does the ESDC want to have marshals forcibly removing people evicting people if it comes to that? Check out White's interview with NY1, with Johnston in the background keeping watch. Only the first four were present yesterday, though others may have been represented by proxies. Authorization for the issuance of tax-exempt and taxable bonds to finance the Arena Project is the only part of the Atlantic Yards Project which is to be considered by the Brooklyn Arena Local Development Corporation this morning. On September 11, 2009, the Board of Directors of the Corporation adopted a resolution authorizing the inducement of construction of the Arena Project through the issuance of bonds in the aggregate principal amount of up to $1,100,000,000 (measured by the “issue price” of the Bonds as determined under applicable Treasury Regulations). The Atlantic Yards Project and ESDC’s participation were also approved by the New York State Public Authorities Control Board on December 20, 2006. There will be two types of bonds that may be issued: Tax-exempt PILOT Bonds and, depending on market conditions, federally taxable Rental Bonds (collectively, the “Series 2009 Bonds”). ESDC will own the land and the Improvements comprising the Arena Project. Because ESDC is exempt from the payment of real property taxes, a PILOT Agreement will require the Company to make PILOTs in an amount not exceeding the actual real property taxes which would be levied on the Arena land but for ESDC’s ownership. The amount of the PILOTs are anticipated to be sufficient to pay principal and interest on the PILOT Bonds and a portion of the operating expenses for the Arena. Upon delivery of vacant possession of the land upon which the Arena will be situated to the ESDC, ESDC will lease the land to the Corporation for the purposes of the Arena Project for a term not to exceed 37 years pursuant to the terms of a certain Ground Lease Agreement. The Corporation will then sublease the land, and lease the Arena as constructed, to the Company pursuant to the Arena Lease Agreement. How will bonds be paid back? The Company’s obligation to pay PILOTS pursuant to the PILOT Agreement will secure the PILOT Bonds and the Company’s obligation to pay rent under the Lease Agreement will secure the Rental Bonds. The Company will use revenues generated by and associated with the operation or use of the Arena Project to make PILOTs under the PILOT Agreement as well as rent payments under the Arena Lease Agreement Such revenues will include, but not be limited to cash and receivables relating to ticket sales (subject to the Nets License Agreement and the League Rules), luxury suite license fees, seat licenses, facility fees, food and beverage concessions, Naming Rights, novelties, memorabilia, broadcast signage and other advertising and product rights. The Corporation will not be financially liable for repayment of the Series 2009 Bonds from its own resources. As part of the transaction, the Corporation will enter into various agreements documenting both the bond transaction and the underlying real estate transactions including the : (i) Master PILOT Indenture of Trust and a First Supplemental Indenture of Trust each to be entered into between the Corporation and The Bank of New York Mellon, as PILOT Bond trustee; (ii) Master Rental Indenture of Trust and a First Supplemental Indenture of Trust each to be entered into between the Corporation and The Bank of New York Mellon, as Rental Bond Trustee, (iii) the Ground Lease from ESDC to the Corporation of the land upon which the Arena is to be situated for a term of ninety-nine (99) years; (iv) the Arena Lease Agreement, Partial Rent Assignment, Assignment of Rental Mortgage, PILOT Mortgages, PILOT Agreement and PILOT Assignment, as previously described, as well as multiple other supporting and related documents. Concurrently with the issuance of the Series 2009 Bonds, the Corporation, ESDC, the City, the Company, the PILOT Trustee, the PILOT Bond Trustee, the Rental Bond Trustee and others, will execute a Commencement Agreement, pursuant to which the net proceeds of the Series 2009 Bonds will be held in escrow by the PILOT Bond Trustee and the Rental Bond Trustee, as the case may be, until the Trustees receive an “Arena Project Effective Date Certificate” establishing, among other things, that vacant possession of the land upon which the Arena will be situated has been delivered to the Company... If such certificate is not issued within approximately one year from the date of the bond issuance (the “Outside Commencement Date”), the net proceeds of the Series 2009 Bonds being held in escrow will be used to redeem the Series 2009 Bonds pursuant to mandatory redemption provisions in the bond documents. Finally, we have been advised by the Underwriters that they are exploring the possible use of credit enhancement with respect to the Series 2009 Bonds, although at this time no decision regarding such credit enhancement has been made. If the Underwriters determine it prudent to utilize credit enhancement in the financing structure, the resolution considered this morning shall authorize the Corporation to approve the terms and conditions applicable to the engagement of any such credit enhancer, as well as all documents in connection therewith, without further action by the Board.